During the elections of 1981, Beit Shemesh made headlines, and not in a complimentary way. Inflation was raging and there was a freeze on the diplomatic front, but the agenda was totally different: It was about what is known in Israel as adatiyut, the origins of various communities. The widespread opinion in Israel at the time was that the Ma’arach represented the Ashkenazi elites, while the Likud was the home of the Sephardim. The rally imploded and Peres was hustled away through a back door by the Israeli police, who shielded him from the furious masses. In the end, the Ma’arach lost the elections to the Likud — by one mandate. Since then, Beit Shemesh has been a cauldron of tensions between various communities, sectors and groups. It was first built in 1950 as the Har Tov transit camp by immigrants from Bulgaria. Then they were joined by new arrivals from Iran, Iraq, North Africa and Romania. At the end of the 1980s, the chareidim set their sights on the developing city and established chareidi neighborhoods. That was just the prelude to the wave of immigrants from Ethiopia, the Soviet Union and the United States. The immigrants established their own communities and neighborhoods, primarily in Ramah Aleph and later in Ramah Gimmel, which generated the multifaceted nature of the city that never really coalesced. The old part of the city remained one enclave, and the new neighborhoods were a separate entity, with the chareidi kiryah in the middle. From the day that the population of old Yerushalayim discovered it as the closest chareidi city to Yerushalayim, they streamed there en masse, transplanting some of the Old Yishuv to Beit Shemesh. Since then, regrettably, the city has been associated with every provocation that arises. Even if a chareidi army deserter is arrested on the Eilat Highway, demonstrations will take place not only at the Russian Compound in the capital, but also on Nahar Hayarden Street in Beit Shemesh. Demonstrations, fires and buses that are stuck have become part of the city’s scenery. From there, it is a steep slope downwards. Spitting on a little girl heading to school ignited the shed ha’adati, the racial genie, taking it to delusional proportions. The earlier elections in 2013 got out of control: Eli Cohen, representing the secular bloc, faced off with Rabbi Moshe Abutbul on the chareidi side, and they battled in the name of racial tensions. It was a terrible war and the city was on the verge of exploding. Abutbul, who won the elections with a tiny percentage, was summoned to court, which ruled that new elections needed to be held. The best forces were enlisted and Abutbul won again with a few percentage points. During his last term, Rabbi Moshe Abutbul advanced the construction and population of new neighborhoods, and the chareidi population in the city grew. The feeling was that in this election, he would win with ease. But the population of the new neighborhoods, amid inadequate infrastructure, led to frustration and bitterness among the residents. 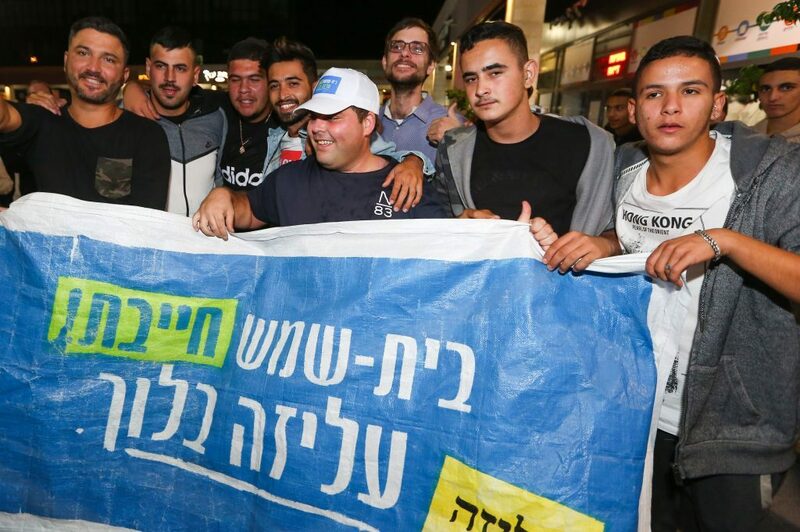 Speak to the new immigrants — mostly from America — who moved to Eretz Yisrael and settled in Beit Shemesh and then discovered the stormy demonstrations each week that undermined the city’s tranquility, and they will tell you that this is not what they moved to Eretz Yisrael for. Their disappointment is acute. Apparently many people wanted a change and decided to give Dr. Aliza Bloch the chance. In many communities in Beit Shemesh there was a high level of complacency. You could hardly feel the elections in the city. Again, they did not take enough into account those who feel unsettled in the city, nor the young, second-generation residents who do not connect to the other groups. Thus, with an advantage of just a few hundred votes, Dr. Bloch gained power, and this time the “hatred and fighting between brothers” came from inside. What is clear is that Beit Shemesh is liable to be a prelude to other cities if people don’t recover and start recognizing the needs of various communities.